These. freaking. SALAD ROLLS!!! I’m actually vv excited to share these with you guys. I guess I should be vv (as in, very very) excited to share all things with you, but tbh: blogging gets tiring. Blogging and working a demanding day job gets tiring. Blogging about food when you struggle to find balance between health and enjoyment — IT’S DEMANDING! I realize this is all pretty first world problem-ish (oh poor me, what kind of food should I CHOOSE to blog about? ), so let’s just nip that right now: I’m really grateful to be able to blog about whatever kind of food I want. But creative burnout is a thing. And I think I’ve been suffering from it lately (like … the last 1.5 years at least). But guess what? I dreamed these babies up recently (maybe 4 days a week at work is letting my creative juices flow again!) and was SO PSYCHED about them. 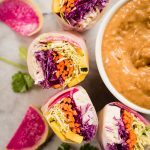 So then I took my sweet time preparing the rainbow of veg, chatted on the phone while rolling all of these salad rolls up, and DEVOURED THEM in my kitchen, alone, spooning heaps of homemade spicy peanut sauce onto them. It was awesome. In reality, these really aren’t that different from normal salad rolls. They have some of the typical culprits: carrots, cabbage, cilantro (and/or mint, and/or basil). But I added grated brussels sprouts and roasted delicata, which are some of my winter staples, as well as watermelon radishes BECAUSE HELLO THEY ARE SO PRETTY. I’m not sure they count as a winter veg (but, they do grow pretty easily in colder weather?? ), but here they are. Also tofu. Tofu is not a veg at all, but fills you up and adds protein and good texture and all that jazz. Can peanut sauce be considered a winter veg? It certainly has been in my diet lately! If you saw my IG stories last night (lord help us all) you’ll know I have nooooo shame in putting peanut sauce on literally anything. Toast/eggs/PEANUT SAUCE. Most of you thought that was a complete abomination, but let me tell you: it’s delicious. No shame. 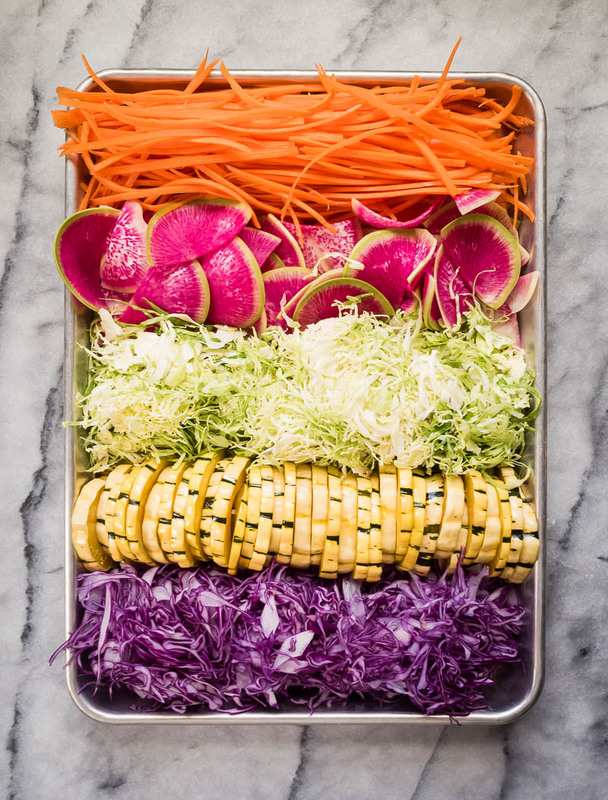 So let’s hear from you guys (comments, helloooo): what would you put in your dreamy winter vegetable salad roll situation? That’s the best part of salad rolls (besides the peanut sauce): you can put whatever you want in them!! The only other version I have on this site, from YEAAARS ago, has grilled peaches in them. 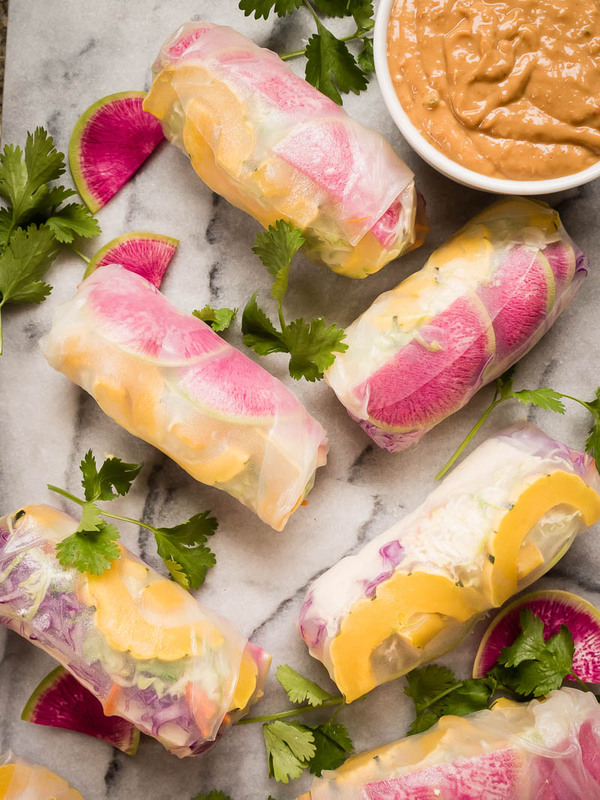 Totes summer salad rolls. 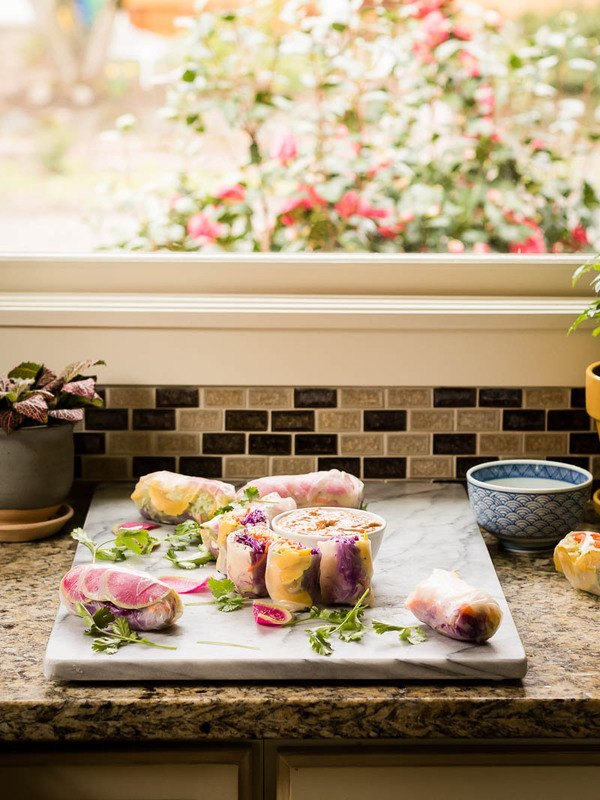 These healthy salad rolls have winter vegetables like brussels sprouts and delicata squash, along with some traditional fillings like carrots, cabbage, and cilantro. Dip these in peanut sauce for a healthy, delicious meal or appetizer! Preheat your oven to 400F. Toss the sliced delicata with the olive oil and salt, spread in a single layer on a baking sheet, and bake for 15-20 minutes, or until fork-tender. Remove from the oven and let cool a bit as you finish preparing the other ingredients. Drain the tofu, then cut it into 3/4″ thick strips (roughly 1″ x 4″ x 1/2 or 3/4″). To assemble the salad rolls, dip a wrapper into a shallow dish filled with very warm water. Gentle shake until it softens up (but don’t leave too much longer!). Carefully remove (bring some excess water with you) and set on a flat counter, plate, or cutting board. If things get sticky, you can use a lightly oiled surface, or a wet kitchen towel. 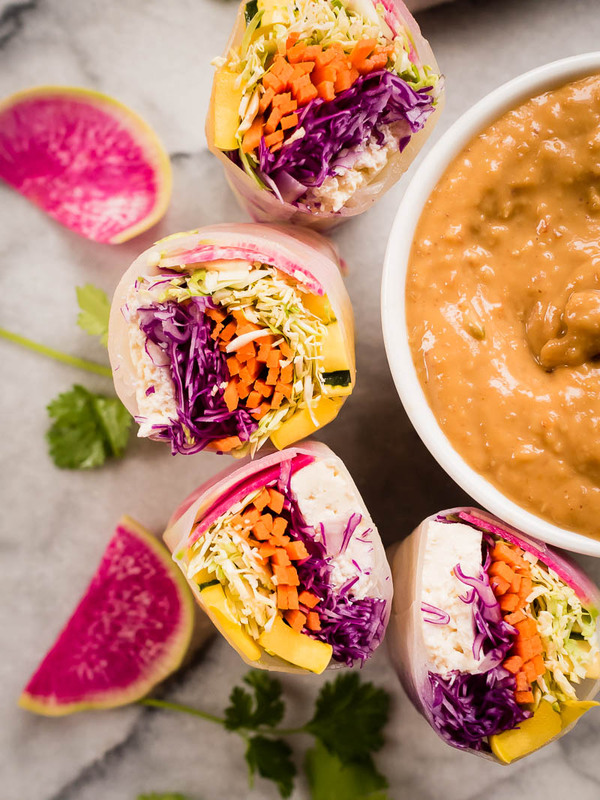 Lay the wrapper flat, then layer one piece of tofu, and then a small handful of the remaining ingredients (except for peanut sauce) in a 4″ wide section starting about 1/3 of the way up the wrapper. Optionally, add a little bit of peanut sauce into the wrapper, or a dash of fish sauce. Fold the bottom of the wrapper up over the ingredients, roll snuggly to get them all together, then fold in both sides, and continue rolling until the top is completely sealed. Set aside, and repeat with the rest of the ingredients. Serve with plenty of peanut sauce!